If an NCO (noncommissioned officer) is the backbone of the U.S. Armed Forces, then the first sergeant is the heart and soul. No other enlisted person carries the responsibility and authority of the first sergeant. The First Sergeant is the primary liaison with the commander on all matters concerning the enlisted corps. He or she is the eyes and ears for the commander and the voice of the enlisted force. The role is important that all of the services, with the exceptions of the Navy and Coast Guard, use them. 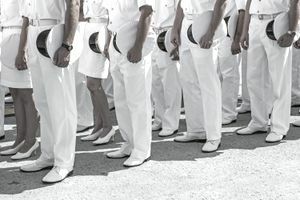 The Navy and Coast Guard split the duties of the First Sergeant between various Chief Petty Officers, the COB (Chief of the Boat), and the Squadron XO's (Executive Officers). In the Army and the Marines, the first sergeant is a rank E-8. In the Army, depending mostly upon your military occupational specialty (MOS) and other qualifications, when you are promoted to E-8, you become either a first sergeant or a master sergeant (who usually serves in a staff position). In the Army, the first sergeant retains his or her original MOS. In other words, an Infantry MOS becomes an ​infantry first sergeant and a medical MOS becomes a medical first sergeant. In the Marine Corps, selective E-7s are chosen to become first sergeants upon promotion to E-8. These select few are then awarded a new MOS and can be assigned first sergeant duties in any type of unit, regardless of their original MOS. In the Air Force, the position of the first sergeant used to be a volunteer-only occupation that could be held by an E-7, an E-8, or an E-9. Under that system, one volunteered to retrain into the first sergeant career field, and, if accepted, remained in that job for the rest of their career, unless they applied to retrain again (or return to their job), or got disqualified (fired). All of this changed in October 2002. The job of the first sergeant in the Air Force is now a special duty assignment" with a set tour length of three years. Volunteers are still sought, but if there are not enough, non-volunteers in the ranks of E-7, E-8, or E-9 are selected based on their service records and commander recommendations. The first tour is for three years. About two years into the tour, the member can apply for another three-year tour, and, depending on Air Force needs, may be selected for a second tour. Like the Marine Corps, an Air Force first sergeant can be assigned to first sergeant duties in any type of squadron, regardless of what their previous job, or Air Force Specialty Code (AFSC), was. Because of the high degree of responsibility and performance required for first sergeants, members returning to their previous jobs after this three-year tour will likely be much more competitive for promotion. In all the services, however, you can recognize the first sergeant because of the diamond centered on the chevrons of his or her uniform, which was first authorized for wear in the Army in 1847. The first sergeant has always been held as a highly visible, distinctive, and sometimes notorious position in the military unit. It has a convoluted history which dates back before the United States was even founded. The 17th century Prussian Army appears to have been the starting point for what was later called the first sergeant in the U.S. Army. The Prussian Army Feldwebel seems to have combined the duties of not only the first sergeant but of sergeant major as well. Standing at the top of the noncommissioned hierarchy of rank, they were the "overseers" of the company's enlisted personnel. To this end, they kept the Hauptman, or company commander, informed of everything that went on in the company; whether NCOs were performing their duties in a satisfactory manner, whether their training was properly accomplished, and that all soldiers were accounted for in their quarters at the end of the day. George Washington relied heavily on the advice of General Baron von Steuben when deciding how to set up what would become the U.S. Army. During this time, von Steuben wrote what is referred to as the "Blue Book of Regulations." This book covered most of the organizational, administrative and disciplinary details necessary to operate the Continental Army. While Von Steuben outlined the duties of such NCOs as the sergeant major, quartermaster sergeant, and other key NCOs, it was the company first sergeant (the American equivalent of the Prussian Feldwebel) to which he directed most of his attention. First sergeants must be "intimately acquainted with the character of every soldier in the company and should take great pains to impress upon their minds the indispensable necessity of the strictest obedience as the foundation of order and regularity," von Steuben wrote. Since the first sergeant was responsible for the entire company, he was, in von Steuben's words, "not to go on duty, unless with the whole company, but is to be in camp quarters to answer any call that may be made." On the march or on the battlefield, they were "never to lead a platoon or section, but always to be a file closer in the formation of the company." First Sergeant as "Top Kick" and "First Shirt"
In the Army and Marines, the first sergeant is often referred to as "Top" or "Top Kick." The first sergeant is the top enlisted person in the unit and a metaphorical "kick in the pants" is a motivational tool to get the troops into gear. In the Air Force, a first sergeant is often referred to as "shirt," or "first shirt." The origins of this term remain a mystery, but it has stuck around and led to spin-off nicknames: Prospective first sergeants who are shadowing Air Force first sergeants are known as "undershirts" and Air Force NCOs who temporarily fill in for the first sergeant when the "shirt" is on leave are often referred to as "T-shirt" (in which the "T" stands for "temporary").